The So Cal road trip is soon coming to an end… I’ve seen the beaches. I’ve fried in the desert. Now it’s time for some reprieve in the mountains. 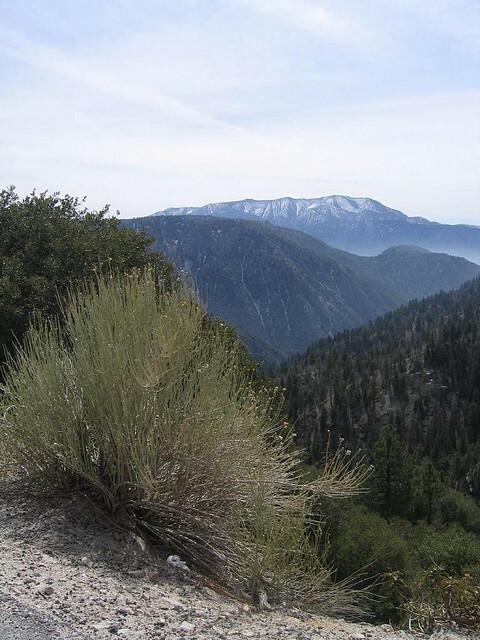 I leave the north side of the park and head west to the San Bernardino Mountains. The desert is subject to flash flooding in the winter time as the soil can only absorb so much water at once. When I was traveling out on CA-247 it was just small hill after small hill, like whoop-de-doos on a race track. The suspension in the car made for a super fun ride. There was one hill which must have been at least a 30pct grade that was a major hit the brakes. No warning of a drop off that severe. I ran across a kid who was pushing his dirt bike. When I stopped I found out that he ran out of gas on his motorcycle. He lived down the way (about a country mile) so he was content to push it home. It brought back fond memories of the same some 15 years, well maybe 2 years ago :). Once I took the left on CA-18, I began the rim of the world tour. 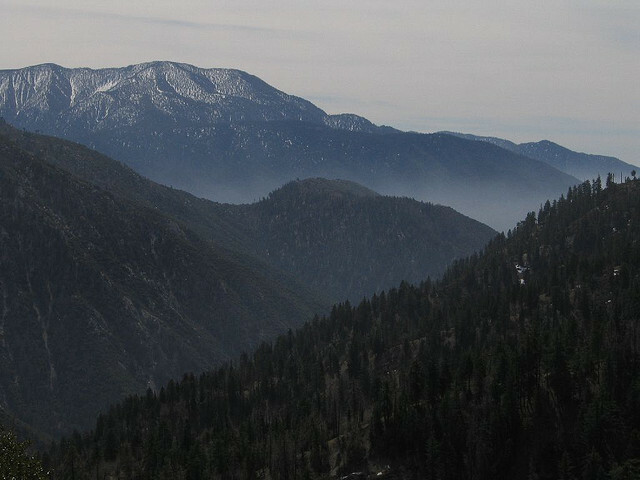 CA-18 winds along the crests of the San Bernardino mountains. I have a steep climb up (sans guard rails which seems to be a theme in this state). 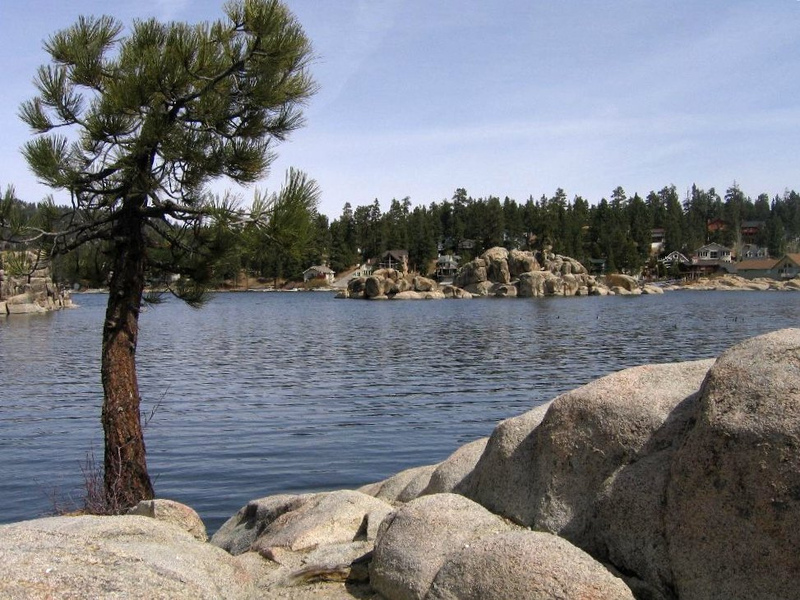 The stop for the night was Big Bear Lake, a resort community for those in LA. Being Sunday night in the off season, I didn’t expect to see any stars, but I scored a great room. I got a spot in an up-scale place with a lake view at 1/2 price. I can deal with that! Being up in the mountains I went for some steak at The Cowboy Express. A quick review: Food – A, Service – C, Atmosphere – A-. It was Sunday evening and slow, but the service really was slow. Not sure if they were missing staff that night as it came recommended by the hotel. Monday Morning I slept in and hit the road about 10:00am and had a long journey ahead of me: drive the rest of the rim, around LA, across the San Joquain Valley, over the Pacheco Pass and into San Jose: about 450 miles. The rim is truly beautiful. Most of the mountains out to the coast were cloaked in fog so all you could see was the peaks. But as all good things come to an end, I had to leave the mountains and hit the LA Freeway. Only problem was… it wasn’t there. 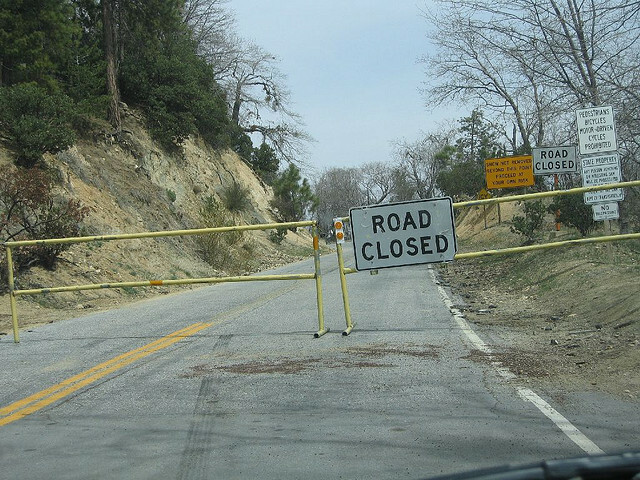 I saw the road closed and there was nowhere to go. No detours, nothing. Fortunatley the GPS helped me around the fact that I were missing about 6 miles of downtown freeway. Once getting back into the bay area I hit… you got it…Rain. Sorely needed, and welcome, even from this two wheeler!